Program launchers could see a boost in popularity when Windows 8 gets released later this year. the reason is simple: Microsoft has done away with the start menu, which was used by many Windows users to launch programs and perform searches for files and applications on the system. With the start menu gone, attention has shifted to the taskbar, the desktop, and the new Metro UI start page. Program launchers could fill the gap by offering another option to start programs on the system. XLaunchpad is a free program launcher that displays program file, and folder shortcuts when invoked. The program runs silently in the background most of the time. You can bring its layer up front with the F12 key on the keyboard, or by moving the mouse cursor into the upper left corner of the screen. All open windows and programs are hidden on the screen when that happens. They do not get closed or minimized, and appear in the location they have been when you tap on F12 again or move the mouse into the screen corner. A list of files, programs and folders is displayed on the screen. You can load programs, open files in their default viewer or folders in Windows Explorer with a left-click. This view mode is also used to rearrange, delete, add or manage entries that are displayed in the application launcher's interface. A right-click opens a context menu with options to add files or folders to the interface. Newly added shortcuts are appended at the end of the last listed icon on the screen. You can use drag and drop to sort shortcuts differently on the screen. 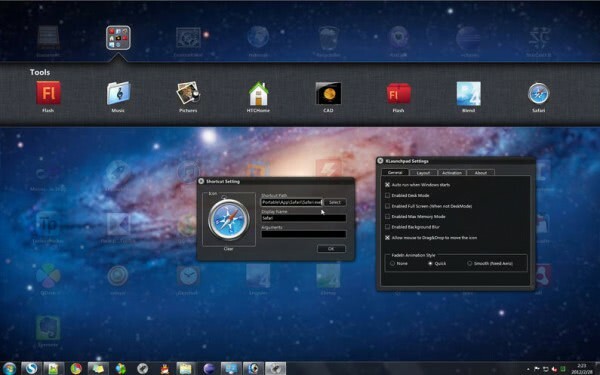 The application launcher supports multiple desktops indicated by dots in the lower center of the screen. This can be useful if you run out of space on the first desktop, or if you want to divide applications, files and folders into groups. You may now ask yourself how the solution differs from placing icons on the desktop directly. On first glance, both options look to offer about the same feature set. You can place folders, programs or files (or shortcuts) on the Windows desktop and on the program launcher's desktop. You can hide all open windows and programs with the show desktop button, or with the F12 key. You can't divide desktop icons on multiple screens unless you install a third party software that adds multiple virtual screens to the operating system. Physical files and folders on the desktop may furthermore slow down the start of the operating system. From what I’ve read, as much I was and remain excited about moving to Seven, as little I am at the idea, at the concept of what I think is that of Windows 8. I don’t want to move to a residential duplex with 77 services between the entry and my flat, I want a flat, a nice a very nice flat, but with direct entrance. I’ll have to go through this whole Metro entrance before accessing MY computer ? Ouf. I much prefer RocketDock…it sits at the top of my screen, hidden until I move the mouse to the top, and gives me shortcuts to my most often used documents and programs. Adding a Stacks docklet gives me a pop-up group of shortcuts in a folder of my choosing. It’s also skinnable, and completely free. Thank you so much, this software is amazing.